ANN ARBOR – Round 1 goes to the Wolverines. 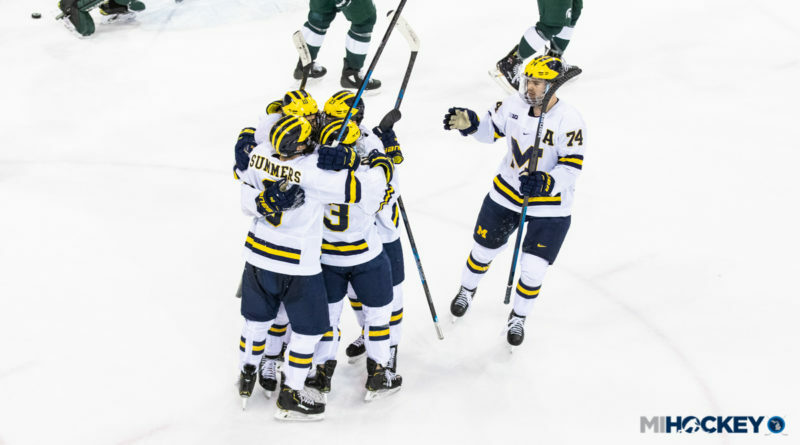 In the first of two rivalry weekend games with the Spartans, Michigan prevailed 5-3 at the Red Berenson Rink inside Yost Ice Arena in Ann Arbor Friday evening. Three unanswered goals in the second period from Michael Pastujov, Jack Becker and Will Lockwood gave Michigan a commanding 4-1 lead heading into the third period, and it was too much for Michigan State to overcome. Becker also opened the scoring in the contest and Pastujov wrapped up in the third, while Hayden Lavigne recorded the win between the pipes for the Wolverines. Sam Saliba, Austin Kamer and Wojciech Stachowiak scored for Michigan State. All eight goals came even-strength, despite it being a typical “backyard brawl” game with a substantial amount of penalties. The two teams play their annual ‘Duel in the D’ game at Little Caesars Arena Saturday night in the weekend finale; Michigan State is technically the home team this time around.